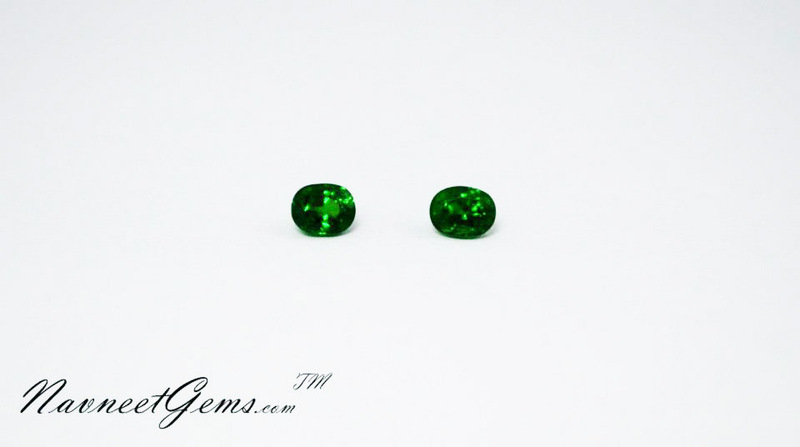 Tsavorite Gems, is also known as Green Garnet and Navneet Gems and Minerals is a supplier of this Colored Gemstone. No one can estimate the market value of this stone by just keeping the category in his/her mind. There are semi precious stones which are more expensive than precious stones like Alexandrite and apart from these Tsavorite (Green garnet), Tanzanite, Tourmaline, Iolite and other stones don’t fit in their assigned category because of their medium to high price range. 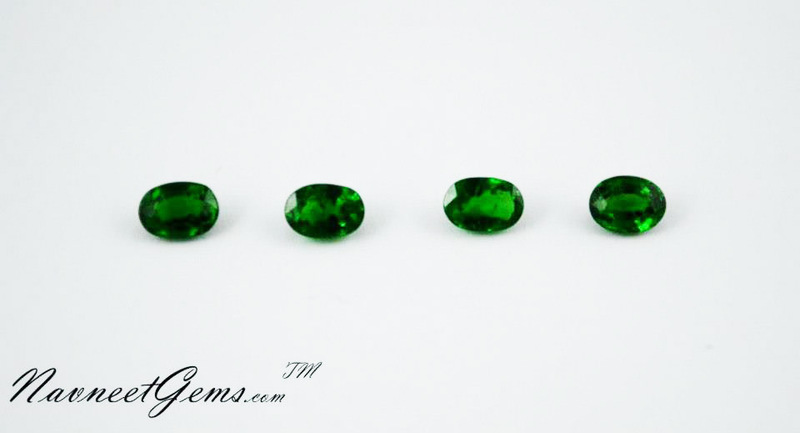 Tsavorite is the Chrome Green Garnet which has superior gemological characteristics and comes from East Africa. It is called the ‘replacement for Emerald’ because of better price, color and quality than Emerald and can be easily used in daily use rings and earrings. Another big thing is that it is not even treated in any way and completely natural where as most of the Emeralds are oiled. It’s has not been a long time since Tsavorite was discovered. The first sample of this grossularite Garnet was discovered by Campbell Bridges who at the time was working as a consultant of Tiffany and Co. Campbell first discovered the deposit near Kenya’s border in Tanzania and then in Kenya in 1970 and Tiffany and Co.’s then president Henry Platt named it Tsavorite. Of big size Tsavorite above 1 carat, only 2.5% are above 1 carat and 85% were under 1 carat which shows the low availability of Tsavorite. It is difficult to find a Tsavorite above one carat in top quality without any of the inclusions, which is even rarer than Emerald. 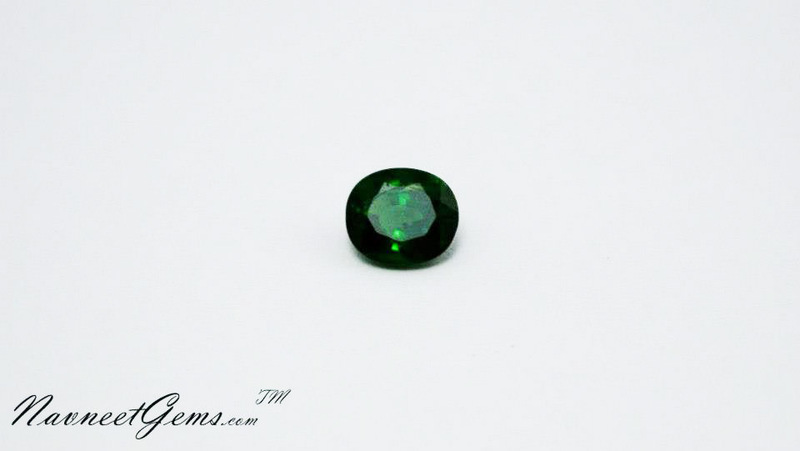 Only few companies like us have good quality Tsavorite in more than 1 carat in nice color. Here we also sell in calibrated sizes. Pears, ovals, rounds are the most popular shapes in this stone. Tsavorite Garnet has recently become popular, since the start of the 21st century. Earlier the deposits were found in very less amounts and in very poor quality, but the recent increase in the supply has meant a lot of Jewelers have started using this Green Garnet, as a replacement for Emerald, which is quite expensive and not clean. If you are looking for a supplier of Wholesale Tsavorite, at very competitive Factory prices, straight from Thailand, than kindly contact us. We currently have all the shapes and sizes in stock for Tsavorite. We also make Tsavorite Garnet on order, for custom shapes or cuts, as our skilled cutters will shape the rough in the customers’ orders way. Tsavorite is used in many countries, including the United States of America, and the European countries, like Turkey which uses a lot of Emerald as well as this replacement for Emerald, Tsavorite Garnet. The vivid and radiant green color of Tsavorite is desirable and demanding. 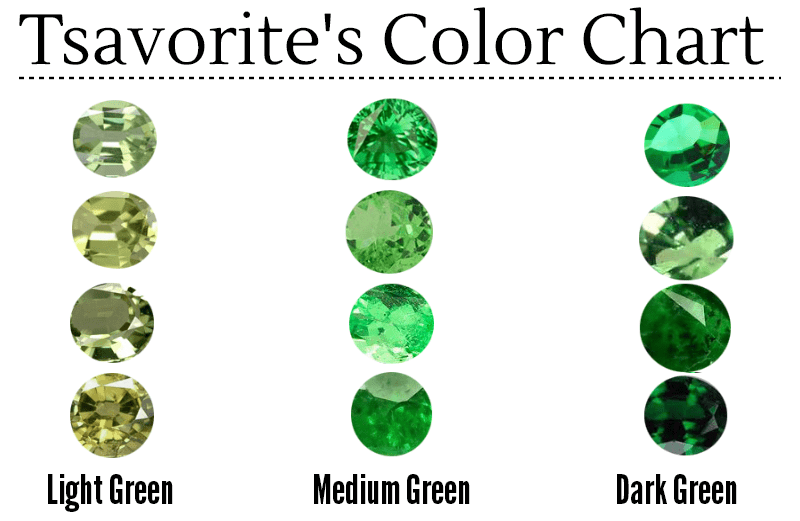 Let’s compare it to the other green color stones with Tsavorite. Green Tourmaline and Emerald are other green stones and if you see the Chrome color of Tsavorite in front of the other green stones then you will see how deep green and sparkling the color of Tsavorite has and this green intensity makes this stone unique. You can even see the light of this stone through cloth. Tsavorite is one of two green varieties of Garnet, though arguably the more important of the two. Especially in smaller sizes, Tsavorite creates competition for Emerald because it is less included, rarely treated, and more durable. Like some Emerald and Green Tourmaline, Tsavorite Garnet owes its green hues to the presence of vanadium and chromium. Different color and cuts of Tsavorite gems – Tsavorite Garnet comes in different shades from pale green, medium-green to vivid blue-green. The most expensive color comes with nice luster and saturated green without any yellow tint and not dark in anyway. The price of Tsavorite Garnets also depends on shape. Ovals, rounds and cushions are the most popular shapes and you will always see 1 carat or above stones in these shapes. This completely natural stone we produce in Bangkok, Thailand as we run our own factory in Chanthaburi for loose semi precious and precious gems. We source raw material from the Scorpion Mine in Taita, Kenya and the other mine from Tanzania. Scorpion Mine material is better than Tanzaian mines and mostly big size (near 1 carat and 1 carat and up) are made of The Scorpion Mine’s material. It became easy for us to source rough of this stone because we already had our sources in the Tanzanian Mines who are also supplying us with our Tanzanite material. Tsavorite is the younger brother of Tanzanite in the matter of availability, as Tanzanite is only found in Tanzania, in the same way Tsavorite is found only in a few mines. Due to the low availability of raw material, prices for ready stock have been raised. Only a few companies are able to supply ring or earring size Tsavorite stone and we are one of them.